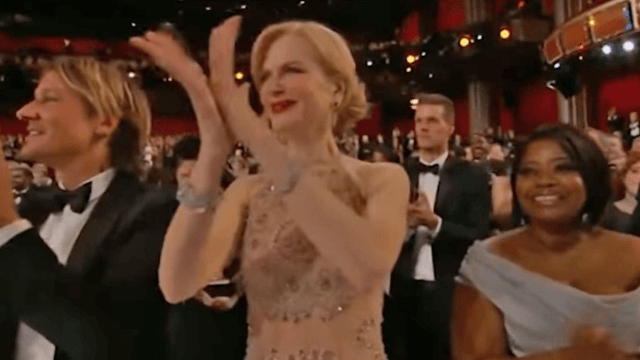 The most curious theories about Nicole Kidman clapping like an alien pretending to be a human. At the 2017 Oscars Sunday night, Kidman was at it again, where "it" is the most bizarre, alien attempt at clapping anyone's ever seen. Hmm. Why? Are her finger bones too fragile to slap into each other? Is... nope, that's the only theory I got. Let's turn it over to Twitter for some extremely reasonable hypotheses. 1. She learned from high society. 2. She's channeling Johnny Depp. 3. It's all a lie. Where are the undoctored videos of Nicole Kidman clapping? 5. She has salad fingers. 7. No one taught her! 8. She's an elf or a goblin. 9. She's a wax figure come to life, still integrating into human society. If you have any further information on the origin behind Nicole Kidman's inhuman clapping style, please get in touch with us via the Someecards tip hotline. Your identity will remain anonymous.